Preheat oven to 160°C (325°F). Place the pistachio meal, sugar, flour, baking powder, eggwhites, butter and rosewater in a large bowl and whisk to combine. Spoon the mixture into 3 x 10cm lined springform cake tins, or 12 x ½-cup-capacity (125ml) lightly greased cupcake tins. Bake for 40–45 minutes or until cooked when tested with a skewer. Set aside to cool for 10 minutes. Remove from the tins and place on a wire rack to cool completely. While the cakes are cooling, make the vanilla and rosewater syrup. Place the sugar, water, vanilla and rosewater in a small saucepan over medium to high heat. Bring to the boil. Cook for 8–10 minutes or until thickened. Set aside to cool. Place the cakes on a serving plate. 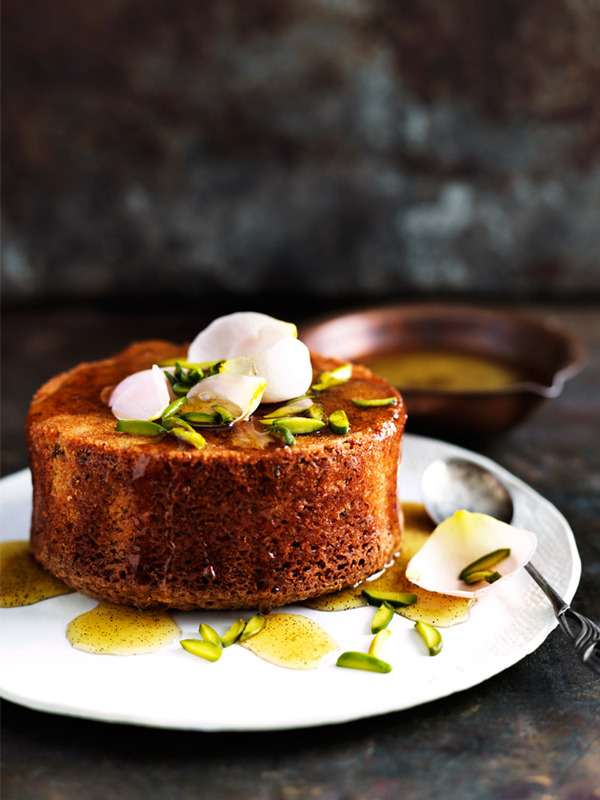 Drizzle with syrup and top with rose petals and pistachios to serve. Serves 12. + To make pistachio meal, place raw pistachios in a food processor and pulse until finely chopped. You can also you almond meal (ground almonds) instead of ground pistachios.